Photo by T Charles Erickson. 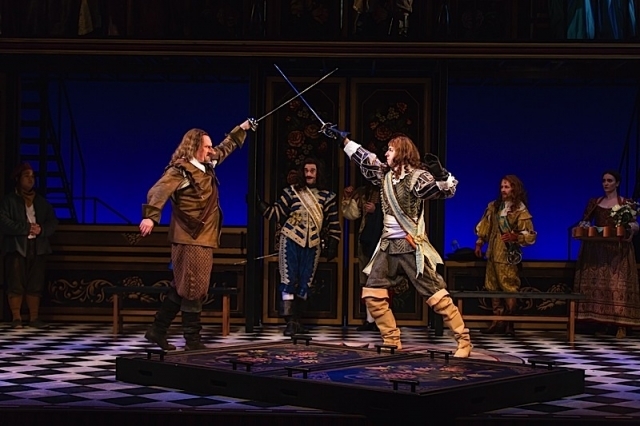 The Guthrie Theater has returned to roots implanted in the early 1960s by founder Tyrone Guthrie who held a vision of classical theater in middle America on a par with that which one could regularly see in England and to a lesser degree, in Manhattan. 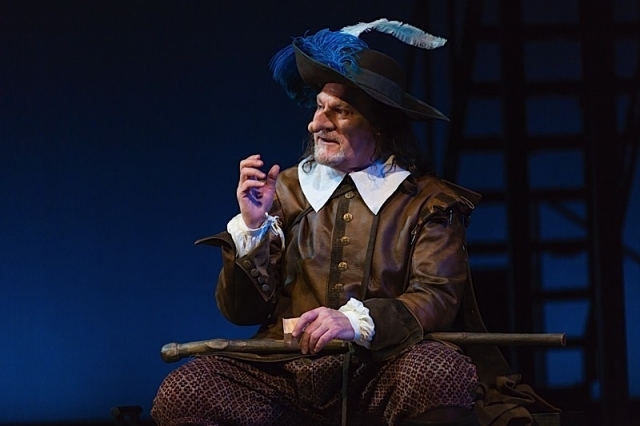 With Joseph Haj’s exquisite adaptation of Edmond Rostand’s 1897 beloved masterwork, Cyrano de Bergerac, the Guthrie returns to its roots with more certainty than any production since Haj took the Artistic Directorship reins in 2015. Haj shifts gears from contemporary good guy with postmodernist inclinations to a genuine classical man, Renaissance Man. The result is a kind of personal landmark and is good for the Guthrie in our time of change. Director/adapter Haj truly apprehends the ancient Western concepts of manly honor, heroism, and their subsequent self-denial, minted in past centuries. 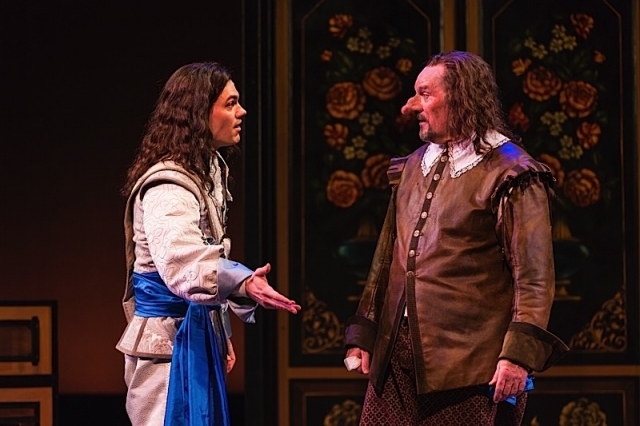 It’s a concept that would have definitely been long anchored in the 17th century when the actual Cyrano, on whom the play is inspired, walked the French earth. The Haj-Rostand Cyrano is a lovably archaic figure rooted in the legacy of chivalry. In service of this understanding, Haj’s collaboration with title role actor Jay O. Sanders is staggering. They’ve manifested that chivalrous legacy palpably, with echoes of Cervantes’s Don Quixote. Sanders is the magnificent embodiment of a kind of masculine vitality that frankly and regrettably seems to have been lost in our current time. His portrayal is a mixture of ruggedly vibrant machismo and keen intelligence. Though he is aggressively competitive with other men, especially the young Christian (a tempestuous Robert Lenzi), his upbringing, his militaristic loyalty, and faith are safety valves against that lower self-quality getting his goat. We can sense that struggle viscerally beneath the surface of his persona as evoked by Sanders. 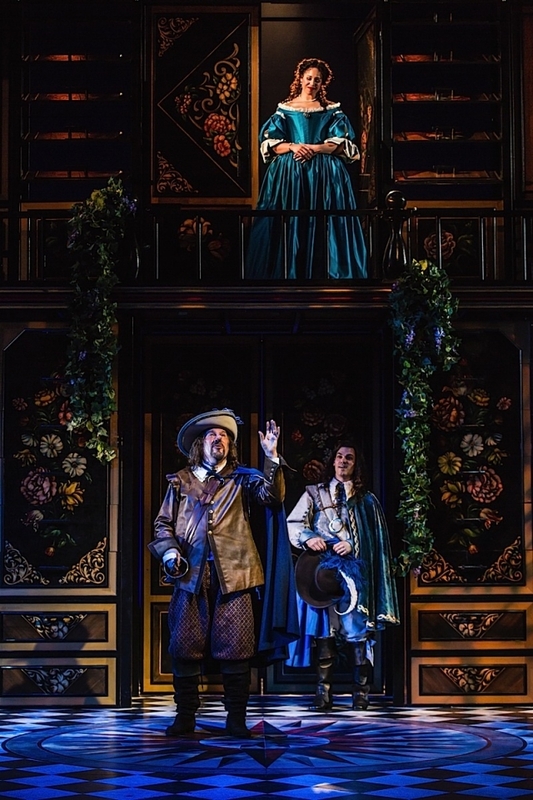 The actor plays this out delicately, poignantly, and sublimely as Cyrano resists revealing his unrequited love to the unwitting Roxane (a gracious Jennie Greenberry). It creates dramatic tension, as well as an affection for the man’s endearing and enduring human nature. The noble choice is to never sully an ideal memory, even if it’s false. Let God sort it out, and ultimately He actually does so in the course of Rostand’s bittersweet overview. It’s the dance between the rugged and the delicate that makes the Haj-Sanders collaboration so numinous. This dance also infuses the fine historically-attuned large cast to a person – beautifully costumed by Jan Chambers and lit by Rui Rita. Here is a classically enlightened production through and through thanks to the generating power of Haj and the infectious exuberance of Sanders. It recalls the kind of vibrancy one would have seen yesteryear and yesterdecade when greats like Jessica Tandy, Hume Cronyn, Trish Conolly, Robert Pastene, Ollie Cliff, Ken Ruta, and Barbara Bryne embedded the Big G’s reputation for great acting. 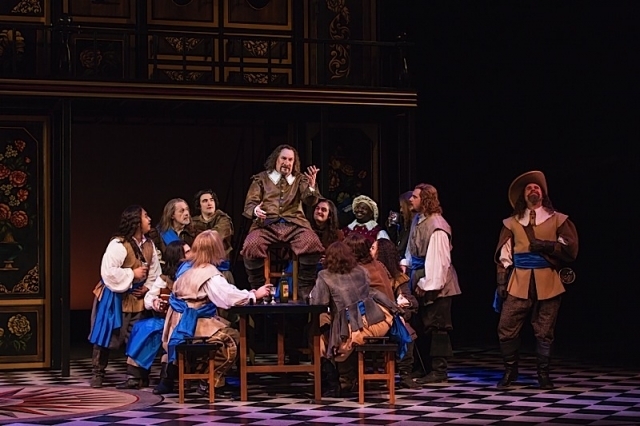 There is actually a Minnesota actress in Cyrano in a direct line with those luminaries, though she’s much younger: Charity Jones. She gives a lovingly warm performance as Mother Marguerite and enhances her reputation as perhaps the best classical actress in the Twin Cities today. The Guthrie ghosts and those elders still living are surely smiling down on her. 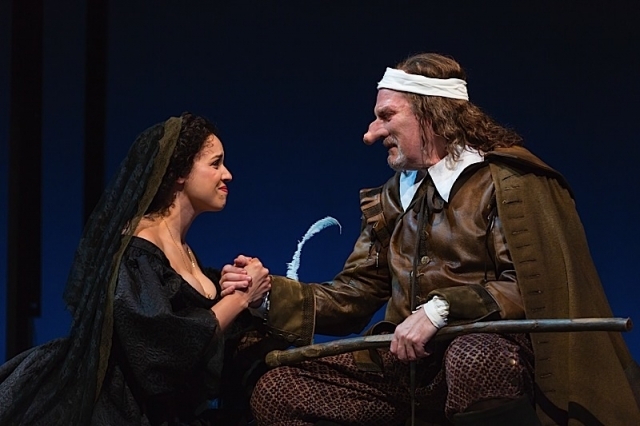 Of course, there’s the play’s proverbial oversized nose, which you can see being shaped online at the Guthrie’s website. The problem of the character’s anguish over the largeness of his nose is built indelibly into the story. It is also a reminder that males, as much as females, are judged negatively for looks that fall short of the standard ideal. Rostand cautions that unhappiness may await us when we fail to be curious enough to peer beneath the surface. This is of course, the tragedy of Roxanne, as much as Cyrano. Looks are only skin deep, as the old saying goes.